Oxy 4 – The latest model in the Oxy line-up is the 4, a 450-size model that carries over all the famous traits of previous models including the oval boom design without supports, tail belt drive, one-way tail drive system and rigid carbon fibre frame and much more. PSG Dynamics Pro Scale TT Mechanics – Scale builds require specific assemblies and with the lure of a Witte Helicopters Lockheed 286L on the horizon, Jon Tanner gets things in order and constructs a set of PSG Dynamics’s Pro Scale TT Mechanics. keeping with the more expensive version. Blade Fusion 270 – The Fusion in a new line of helis from Blade, a brand owned by industry giants, Horizon Hobby. The 270 is the first in the range and boasts a new aggressive look, 4S power system and AR636A flight controller. XK Innovations K120 Shuttle – This might not be a new model but the K120 Shuttle from XK Innovations is a sub-£100 3D heli that ticks lots of boxes. It will suit those new to the hobby or someone looking to keep their eye in with what is a very capable inexpensive machine. 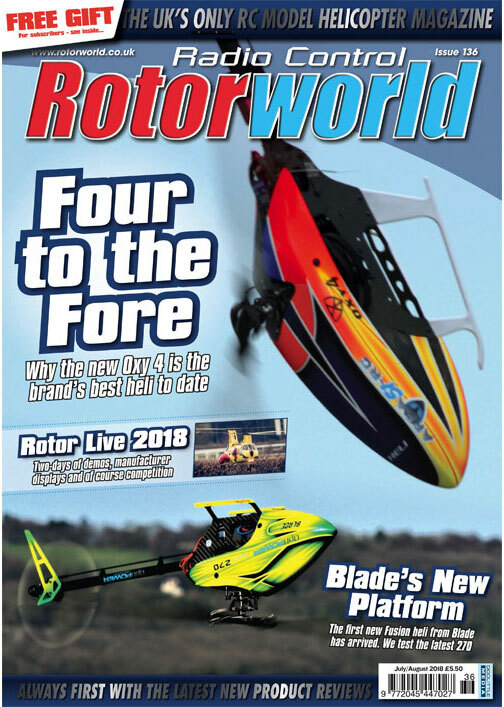 Rotor Live – The annual mega heli event takes place in Baden-Baden, Germany and as in previous years, Rotorworld will have a big report in the next issue from the flight line competitions as well as details of all the new products on show inside the hall. workbench is important. Having a well-lit area is an essential part of working on any model and the Eye Light by Gloforce is the perfect companion for anyone who needs to brighten their work area.